I love winter and winter activities like snowshoeing. I also love working with wood and other natural materials. Out of this it was only logical that a snowshoe business would come. A logical offshoot has been making snowshoe and rawhide furniture. Since I also make and repair traditional wooden canoes I also decided to employ the same wood and rawhide techniques to make a nice canoe seat which you find in my pictures on this site. I have been doing this type of work for the past 25 years now. Not a long time but not a short time either. I’m still learning significant things every year. 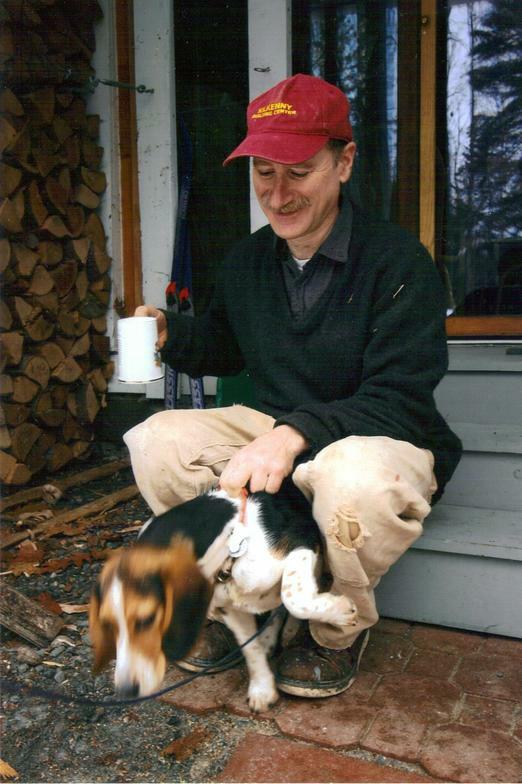 Most of my training has come from taking apart and repairing old wooden snowshoes, snowshoe furniture, and old canoes. It has been a great way to find out the weak points in these items and to try to avoid repeating the same mistakes in my own work. It also has exposed me to a large variety of patterns, designs, and techniques which I have been able to choose from in designing my own products. For the framework of my snowshoes, handmade rocking chairs, and canoe seats I use steam bent Ash wood which grows locally here in New Hampshire. It is ideally suited for the job. It bends well, is strong yet light, and is also attractive. For the weaving I use rawhide. Rawhide is the cleaned and de haired but untanned hide of an animal. I obtain most of my hides locally from hunters and farmers and occasionally from a local slaughter house. I am putting to use a resource which would largely be wasted as there is not presently a good market for hides in our area except for cow hides. After processing the hides using natural methods I then cut them into strips as needed for my products. It is a very strong, attractive medium to work with. The type of hides I use are Deer, Moose and Cow, each having its own characteristics and qualities that I use for different purposes. Lancaster is a little town of about 3500 people located in the White Mountains of New Hampshire. The county in which the town is located is Coos. Pronounced with two syllables. The first o is long, the second is short. My business name is named after this county. This town is perfectly situated for obtaining the materials locally for this business. It took several years to build all the contacts to obtain a regular flow of materials. When you purchase some of my work you take advantage of all this effort. Copyright 2013: Coos Canoe & Snowshoe. Handmade Rocking Chairs. All rights reserved.